With new Away and Third kits being released for the 2002/03 season, the overall design of the Home kit was a continuation of the previous seasons design, with TFG Sports now in their third year as kit supplier. The thick mesh polyester material had the simple black trim at the V neck and cuffs, as well as around the hem of the shirt. In the final year of their seven year spell as shirt sponsors, Telewest re-branded their logo, with this being the only real change to the look of the shirt, with the words "Telewest" and "Broadband" now the same size and font, black in colour with a white outline. 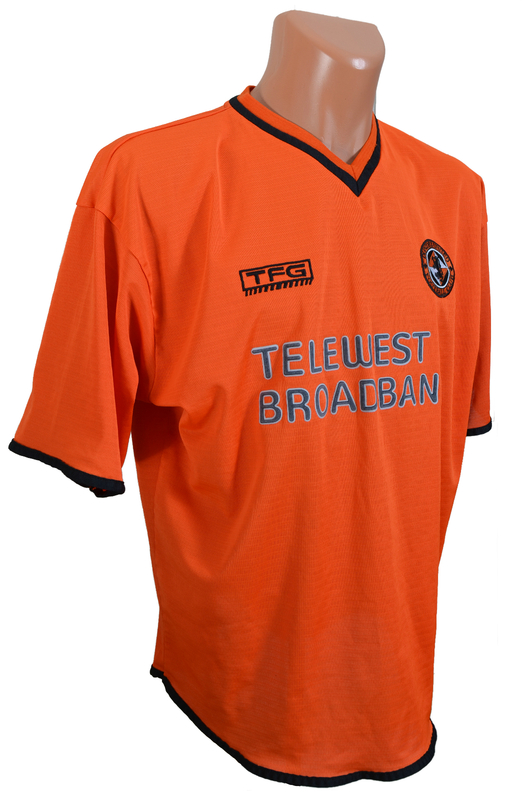 The shirt with the new Telewest logo was first seen in the 1-2 defeat to Kilmarnock in the first home game of an extremely transitional season. After years of trying to gain a seat on the board, businessman Eddie Thompson finally gained control of the Club in September, and after first replacing manager Alex Smith with Paul Hegarty, he eventually appointed Ian McCall as manager in February 2003, with United finishing just 4 points above bottom club Motherwell.